After the events of the Battle of Charlottesville last weekend, a number of left-leaning neo-fascists have banded together to demand the removal of historical monuments that they have found to be emotionally traumatizing. It is a perfect storm of collusion between the snowflake millennials, social justice warriors, the P.C. police, and the radical left. The thought alone is enough to make any red-blooded American shudder. This cabal of comically misinformed misanthropes had set their sites first on the removal of any trace of the first American Civil War, claiming that they are somehow connected to the thrice condemned neo-Nazi violence that took place in Charlottesville. How on earth they came to that conclusion is beyond me, but their historical revision is the hand that we have been dealt. As they proudly expound on their emotional response to bronze likenesses of men much braver than a dozen of their own, they’ve expanded their witch hunt to include anyone with whom they believe did anything offensive. That has included, in recent days, Mount Rushmore, statues of George Washington, and the monument to Thomas Jefferson. This has led one Juanita Broaddrick back into the headlines to appropriate the radical left’s viewpoint, also demonstrating their absolute absurdity, and of course, epically troll former POTUS Bubba Clinton. “The left’s push to remove controversial monuments and statues across the country may be backfiring, as President Bill Clinton’s alleged victims are now demanding a statue of the liberal icon in South Dakota be removed. “Left-wing activists, including many top Democratic politicians, have been demanding the removal of statues and monuments of Confederate generals across the U.S. — with some event taking it into their own hands and removing them themselves. 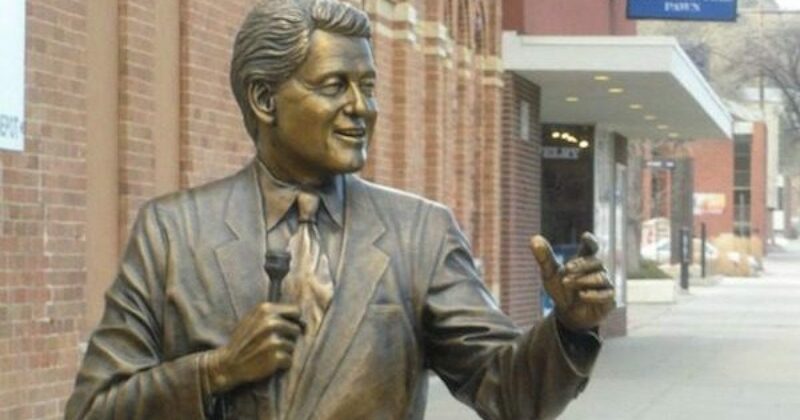 “But now Juanita Broaddrick, who claims she was raped by Clinton in the 1970’s, is adding a statue of the Democratic icon to the list. This begs the question once again: How far will the left go in order to protect their own emotions? Can the First Amendment survive these salacious, heartstring-plucking attacks by the radical liberals of America? Will we begin shutting down museums that portray tragic events in history? Then there is this tweet from Chelsea Clinton, that makes one wonder if she is supporting the movement to tear down monuments or is she agreeing with women like Juanita Broaddrick and Paula Jones about her dadBubba Clinton’s true Identity. The story of Lucifer-who rebelled against God-is part of many Christians’ traditions. I’ve never been in a church with a Lucifer statue.